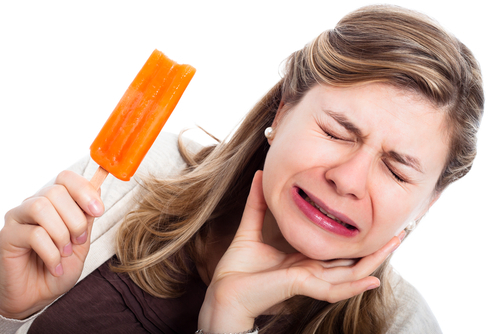 Have you ever experienced pain or discomfort on your teeth from sweets, cold air, hot drinks, cold drinks or ice cream? This is what we call tooth sensitivity. Tooth sensitivity is a common problem that affects millions of people. Some people with sensitive teeth even experience discomfort while brushing and flossing. The good news is that sensitive teeth can be treated. Why does tooth sensitivity happens? Basically, tooth sensitivity is caused by the gradual exposure of the softer part of your tooth that lies under the tooth enamel, called “dentine”. The dentine has got tiny tubes that lead to the nerve and are filled with fluid. Eating or drinking foods and drinks that are hot, cold or sweet can cause a change in fluid movement. This fluid movement causes the nerve endings to react in response, triggering a short, sharp pain. What can I do to prevent/cure tooth sensitivity? One of the best things to do is to speak with your dentist and order custom made fluoride trays for you. Fluoride is a mineral commonly found in water that helps to prevent tooth decay and tooth sensitivity. How to use Fluoride Trays? At bedtime brush teeth thoroughly with a soft toothbrush and regular toothpaste. Floss teeth by sliding the floss up and down each side of each tooth. Note: It is very important to remove all food and plaque from between teeth before using fluoride. Food and plaque can stop the fluoride from reaching the surface of the tooth. Place a thin strip of the fluoride gel into each upper and lower fluoride trays. Place the trays on the upper and lower teeth and let them remain in place for 5 minutes. After 5 minutes, remove the trays and thoroughly spit out the residual fluoride. Very Important – do not rinse mouth, drink or eat for at least 30 minutes after fluoride use. Do not boil the trays or leave them subject to high temperatures.